Buy Online Now! 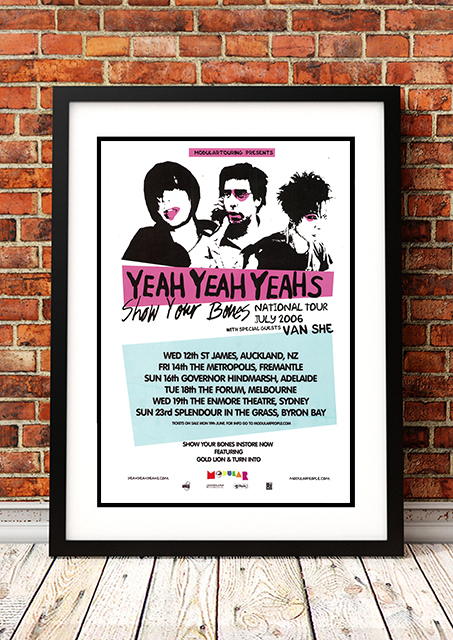 - Yeah Yeah Yeah's Rock Concert Posters and Memorabilia. Yeah Yeah Yeahs are an American indie rock band formed in New York City in 2000. According to an interview that aired during the ABC network’s Live from Central Park Summer Stage series, the band’s name was taken from modern New York City vernacular. The band has recorded four studio albums; the first, Fever to Tell, was released in 2003. The second, Show Your Bones, was released in 2006 and was named the second best album of the year by NME. Their third studio album, It’s Blitz!, was released on March 31, 2009 in the US and on April 6, 2009 elsewhere. Their fourth album, Mosquito, was released on April 15, 2013. The band has been nominated for three Grammy Awards. 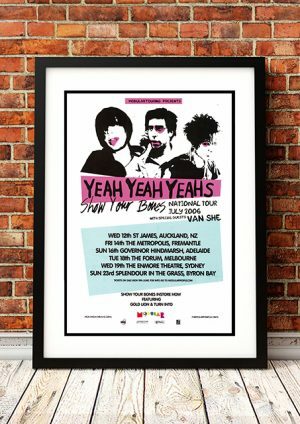 We stock an awesome Yeah Yeah Yeah’s Concert Poster from their Australian Tour in 2006.